Hello friends, how's your week being? I hope it's being planned. As usual I always come here to update the site with news for you and we are thus increasing our knowledge and experience that is how we increase our practice. Today we will learn a different pattern and that is very useful. There are several types and I have separated one for you and hope you like it and enjoy this pattern a lot. Today we are going to learn a new crochet pattern, let's learn how to make beautiful crochet butterfly. With all the step-by-step and information contained here I am sure you will succeed and love to make this pattern. This crochet work is very simple and very fast to make, the crochet butterfly is beautiful and delicate as a real one and can be applied in various crochet work that you do different also because it will give a charm in your very special piece. With this crochet accessory you can create many amazing pieces of craftsmanship so enjoy. 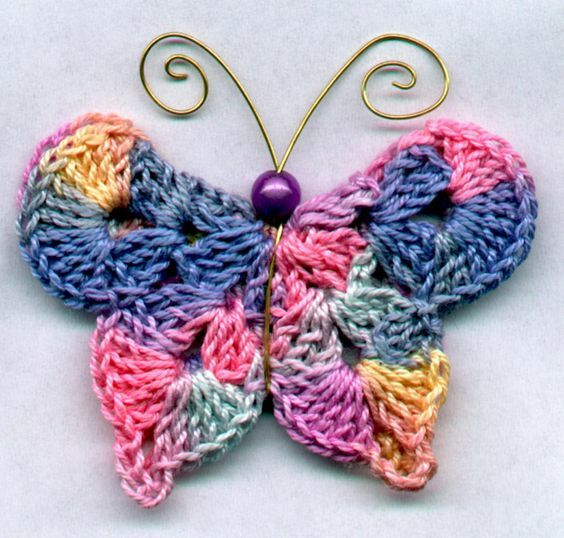 The crochet butterfly is very useful and versatile, it decorates the place where it is placed and leaves the most beautiful piece and you can do in various models and styles that you prefer. Here we separate a beautiful and delicate crochet tutorial for you to practice. 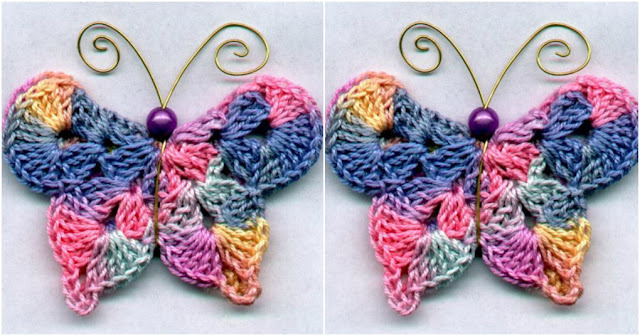 Today you will learn how to make a new butterfly crochet pattern that is amazing, I left model photos ready so you can see how it will look ready and also serve as inspiration for blending colors clearly in the photo. Let's create beautiful butterflies for decoration and also to decorate ready-made pieces. If you do crochet work to sell your crafts and increase your income for the month, this pattern is great for increasing your clientele and increasing sales as it is always good to innovate some pieces. You can make pieces of butterflies separate for people to buy and be able to decorate whatever you want, or you can make patterns and innovate pieces that you already have in your store that may have a touch or pieces that this difficult to sell, thus decorating more and innovating the piece with the crochet butterfly model thus making it more beautiful and selling easier simple pieces. Enjoy this our tip for you and renew your decorating pieces. Make butterflies of various colors so increase your variety and be an incredible pattern and also gives us the feeling of satisfaction by doing something with your own hands so beautiful. Butterfly always rejoices the environment. With these crochet butterfly embellishments you can do several things such as: Decorate children's dress, table cloths, carpets, kitchen ornaments and decorations, make refrigerator magnets, decorate dish cloth that will look gorgeous with the crochet butterfly placed in the corner, can use in blankets of babies, anyway ... whatever you prefer and your imagination to command. If you liked do not waste time, below I have available the pattern written with the step by step of the crochet butterfly of the photo below. Do beautiful work and do not forget to enjoy our Xell Crafts facebook page and stay up-to-date with our news.